A Day Late and A Dollar Short: Disney Store - $10 Ornament Set with Any $25 Purchase! 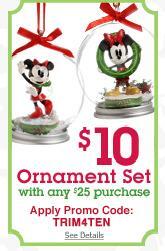 Disney Store - $10 Ornament Set with Any $25 Purchase! Happy Holidays from the Disney Store! Plus, shop though ShopAtHome for an additional 10% cash back on your purchase!